The nose is the uppermost part of the respiratory tract and includes the peripheral organ of smell. The Greek for nose is rhinos. So the study of the nose and its diseases is called rhinology. It is composed of the external nose and the nasal cavity. Protection of the lower respiratory passages. Air conditioning of the divine air. Nasal reflex functionality (example, sneezing). ENT and plastic surgeons to fix the different deformities of nose and enrich the appearances of the face. Doctors to take care of diseases like rhinitis, sinusitis and respiratory diseases consisting of asthma because of environmental pollution. Tip (or apex), the lower free end. Root or bridge, the upper narrow part that is constant with the brow. 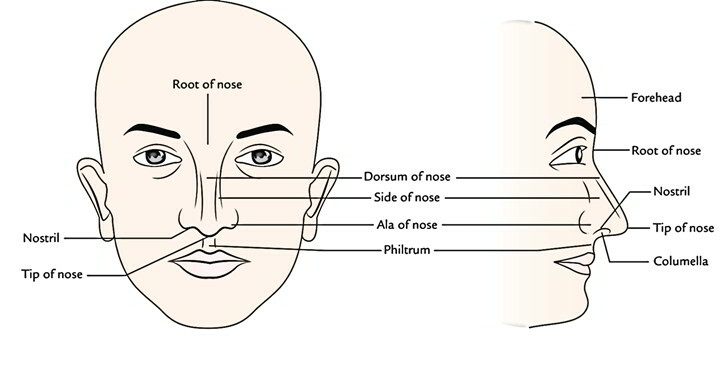 Dorsum, a round border between tip and root where sides of the nose meet. Nostrils or nares, both piriform apertures at the broad lower end. Ala, the lower flared part on the side of nose. The skin covering the nose (nasal skin) is loosely connected to the inherent structures and thin, thus freely mobile. Over the apex and alae, its orifices are generally quite distinctive and it is thicker and much more adherent and includes large sebaceous glands. The hypertrophy of these sebaceous glands supplies rise to a lobulated tumor-the rhinophyma. The skeletal framework of the external nose is partially bony and partially cartilaginous. The upper one-third of the external nose is bony and lower two-third is cartilaginous. Frontal processes of the maxillae. The 2 nasal bones meet in the midline and remainder on the upper part of the nasal process of the frontal bone. They’re held together between the frontal processes of the maxillae. The bony part of external nose ends in front and below as the Piriform aperture. The cartilaginous framework of the nose is composed by 5 chief cartilages and many added miniature ones. A single median septal cartilage. The lateral and major alar cartilages are also referred to as superior and inferior lateral cartilages, respectively. The cartilaginous framework is anchored to the piriform aperture by fibrous tissue. 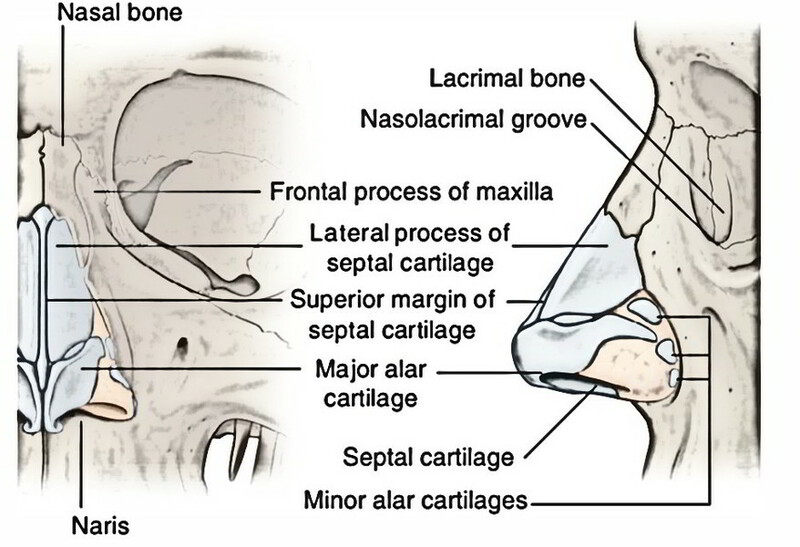 The lateral cartilages, 1 on every side, joined above with the margin of piriform aperture created by the frontal process of maxilla and the nasal bone and below with the major alar cartilage. Medially, it’s constant by a narrow bridge together with the septal cartilage. The major alar cartilage is U shaped and comprises of a medial and lateral crus. The medial crura of 2 sides meet in the midline below the lower margin of the septal cartilage to create the lower part of the nasal septum referred to as columella. The anterosuperior border of septal cartilage runs from below the nasal bones to the tip of the nose. It supports the dorsum of the cartilaginous part of the nose. 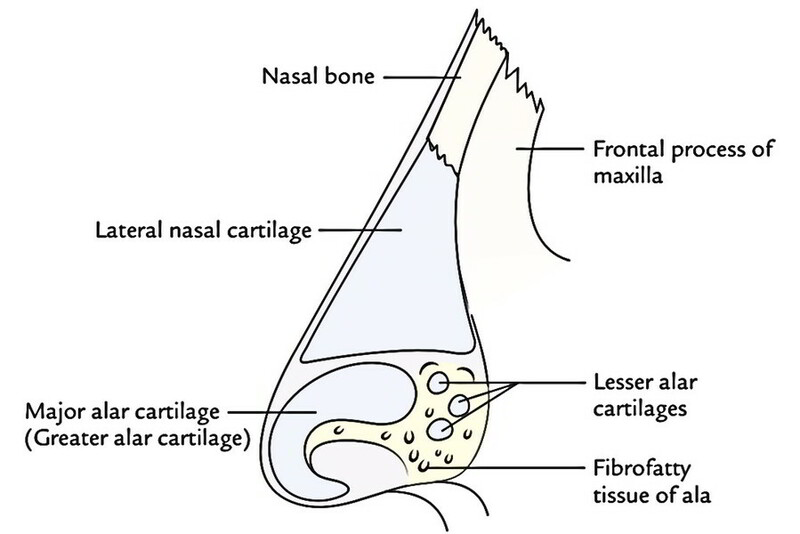 The Lateral crus of major ala cartilage extend into ala of the nose but doesn’t reach the bony margin; the gap is filled up by fibrofatty tissue and small alar cartilages. Along with 5 chief cartilages of the nose, there are 2 or more miniature cartilages, which are located above and lateral to major alar cartilage on each side and called minor alar (orsesamoid) cartilages. They are of no functional and clinical importance. Since the nose is the most projecting part of the face, the fractures of nasal bones are common facial fractures. 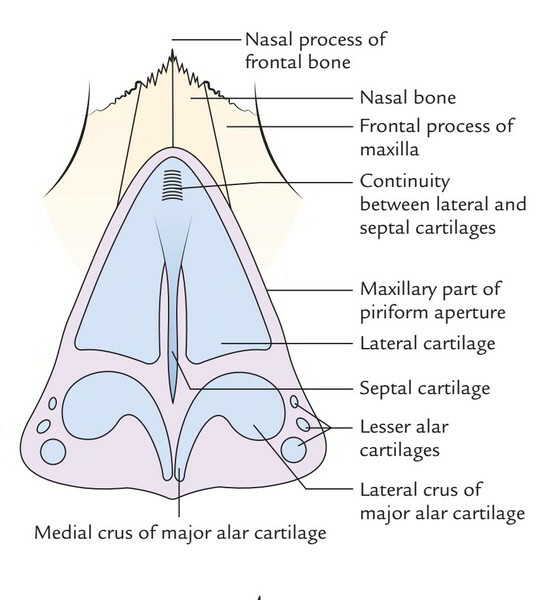 The medial and lateral crura of major alar cartilage keep the patency of the nostril. The angle between the medial and lateral crura is changeable, being acute in high narrow noses and obtuse in low broad noses with flaring alae. This anatomical fact is of great importance in plastic surgery of the nose. 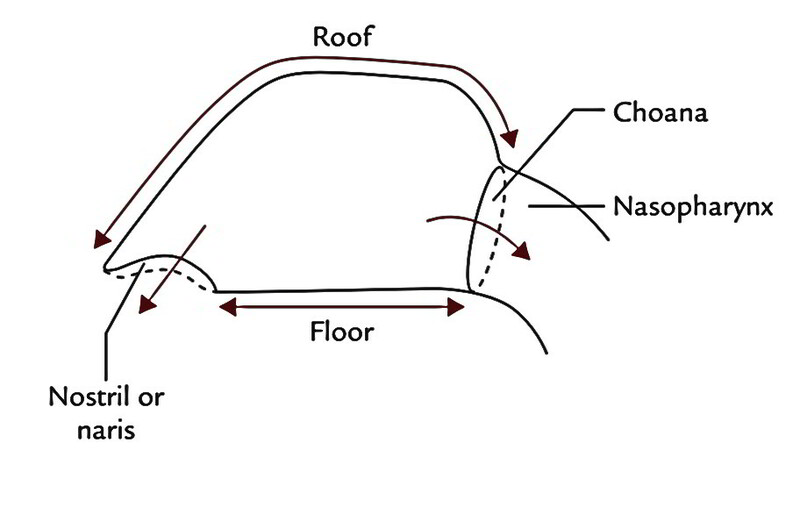 Every nasal cavity interacts with the outside via nostril (or naris) and together with the nasopharynx via the posterior nasal aperture (or the choana). Every nasal cavity is split into 2 portions: (a) a small anteroinferior part lined by skin-the vestibule and (b) a large posterosuperior part lined by mucosa-the nasal cavity appropriate.